My rating in words: I liked it. Betrothed since childhood to the prince of Mynaria, Princess Dennaleia has always known what her future holds. Her marriage will seal the alliance between Mynaria and her homeland, protecting her people from other hostile lands. But Denna has a secret. She possesses an Affinity for fire—a dangerous gift for the future queen of a kingdom where magic is forbidden. Now, Denna must learn the ways of her new home while trying to hide her growing magic. To make matters worse, she must learn to ride Mynaria’s formidable warhorses—and her teacher is the person who intimidates her most, the prickly and unconventional Princess Amaranthine—called Mare—the sister of her betrothed. When a shocking assassination leaves the kingdom reeling, Mare and Denna reluctantly join forces to search for the culprit. As the two become closer, Mare is surprised by Denna’s intelligence and bravery, while Denna is drawn to Mare’s independent streak. And soon their friendship is threatening to blossom into something more. I was promised to her brother. I liked this book, I really did… but I also have some mixed feelings. I wanted to like this more than I did… but I also want to praise this book and recommend it to everybody. You see? I’m a bit confused. So please stay with me while I try to untangle my feelings about Of Fire And Stars. First of all, so much YES to an actual fantasy book where the heroine falls in love with another girl! Yes, we are sorely lacking well written f/f fantasy books in the world and this book should receive so much praise for that. An LGBTQIA+ character as main character is something that is so important and yet we don’t have enough of them. Especially in fantasy. So yes! Also, really, the romance is definitely the highlight of the book. It is so much fun to see the relationship between Denna and Mare develop. Sure, it is a bit of a trope, namely the hate-to-love, but I for one LOVE that trope and I adored seeing it play out here. The scenes these two characters had together were filled with chemistry and I was swooning the entire time. However, when they were not together… I wasn’t all that interested. Don’t get me wrong, I still read this book in a day. The plot kind of reminded me of a murder mystery, which I loved. I thought the story was fast-paced and action-filled, but I also had some problems connecting with it more. And I know other reviewers have pointed out the lack of worldbuilding, but honestly I thought the worldbuilding was okay. Could it have been improved? Sure! For example: in a kingdom that is totally ok with women in position of power – why is it a problem for the eldest daughter to become Queen? Why are they only good to marry off, organise parties and socialize? This doesn’t make sense to me. But overall, I found the world built up enough to get lost in the story. No, I think for me, the biggest problem was the characters. First of all, Denna and Mare seem to be the only characters who really are properly written and multidimensional. The story is written from both their POV, so you get to know both of them pretty well. But I was missing a bit of character development from both of them. Well, especially from Mare. While Denna sort of goes through her own ordeal, it felt like Mare was the exact same person at the end as she was a the beginning. Which was a shame to me. Secondly, I felt like the secondary characters were all pretty boring, predictable and one-dimensional. They all felt like generic characters: the fun-loving and loyal best friend, the prejudiced and stubborn Directorate, the nice and brave Lord, the new-found friend who’s only there so the protagonist can talk to someone about their love problems. I was especially disappointed with the prince. His character had such potential, but then he was hardly in it and when he was, he was as bland and shallow as could be. And the fact that these secondary characters were so one-dimensional led to two things. One, it made me care less about the plot, as I said before. And two, it made the whole plot rather predictable. If the characters are rather generic and predictable, then the plot gets pretty predictable too. Who is going to die and who is really the mastermind behind it all, it was all pretty obvious early on. I wanted to be surprised or even shocked and unfortunately, I wasn’t. The ending also disappointed me. It felt rushed and unfinished. On the one hand I want to give kudos for being a standalone fantasy, but on the other hand I think this would have been better if it would have been stretched in two books. I am not satisfied with the ending and I need more of the story. Plus, it would have given some more room for character development. Win-win! I know this all sounds rather negative, but please know I really did enjoy this book overall. It was a fun and diverse read and I’d definitely recommend you giving it a try. And I stand by my point, we definitely need more LGBTQIA+ characters as the heroes in these kind of stories. So if you are in the mood for a cute f/f romance, with a lot of horses, a dash of magic and a hint of murder mystery – this is just the book for you! “But some things are stronger than years of freedom. 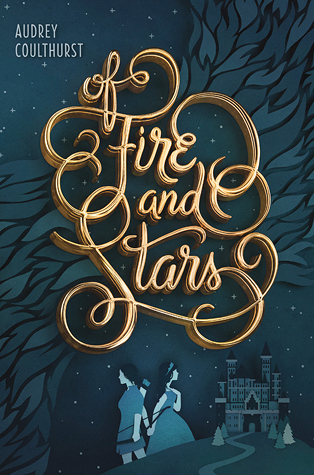 Have you read Of Fire And Stars? What did you think about it? Brittany recently posted…The Crown’s Fate ARC Review & Giveaway! Thanks! Though I had a few little issues, I did really enjoy it overall. Hope you’ll enjoy it too!